Great research aid <> Put your ancestors on the map <> Look really good framed <> Make lovely presents or prizes <> Supplied flat unfolded. Attractive, informative Victorian map showing sufficient detail and features to be of real use to researchers, metal detectorists, local and family historians: in fact anyone interested in how the county or Islands looked over 125 years ago. The scale is a quarter of an inch to one mile, approx. But varies according to the size of the County or Islands. The Northern Ireland county maps have been superbly reproduced, using special enhancing software, at around 150% original size from Philips’ Handy Atlas of the Counties of Ireland (1883) and are by the reknowned mapmaker John Bartholomew. The maps contain an abundance of information such as detailing the Baronies, towns, villages, parks, seats, castles, railways, roads and waterways. 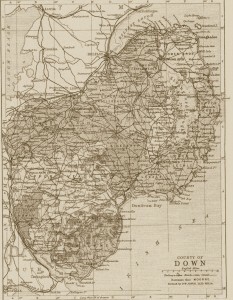 The Channel Islands and Isle of Man maps have been superbly reproduced, using special enhancing software, at around 150% original size from The National Gazetteer of Great Britain & Ireland (1868) and are by the reknowned mapmaker William Hughes. The maps contain an abundance of information such as detailing the Sheadings (Man), towns, villages, roads, waterways, railways (Man) and mountains (Man). Maps are orientated Portrait as County Down, shown or landscape.